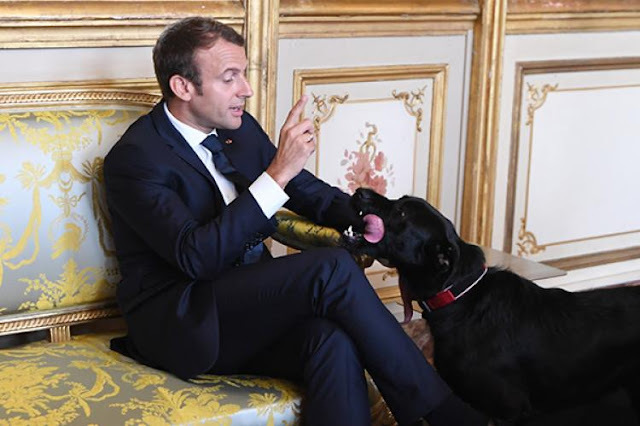 President Emmanuel Macron adopted Nemo, a two-year-old labrador-griffin cross, from a rescue centre in August. PARIS - President Emmanuel Macron's dog Nemo has been filmed casually peeing on an ornate fireplace at the Elysee Palace as the French leader met with members of his government. Macron's meeting with the three junior ministers was interrupted by the sound of Nemo relieving himself noisily and at length behind them, much to their amusement. "He is doing something quite exceptional," says Macron in the video recorded by the LCI news channel. "It happens often?" asks one of the ministers. "No," Macron replies laughing, "You have triggered a totally unusual behaviour in my dog." Nemo, a black two-year-old labrador-griffin cross, is regularly photographed accompanying Macron and his wife Brigitte on official duties. The Macrons adopted the dog from a rescue centre in August. Nemo is not the first presidential pooch to misbehave. Nicolas Sarkozy's dogs reportedly caused thousands of euros (dollars) worth of damage to furniture in the palace. President Emmanuel Macron's dog Nemo has been filmed casually peeing on an ornate fireplace at the Elysee Palace as the French leader met with members of his government. Macron's meeting with the three junior ministers was interrupted by the sound of Nemo relieving himself noisily and at length behind them, much to their amusement.